The Kia Rio is the perfect sedan! With great technology features and premium interior features, all at a low starting price, the 2015 Kia Rio is a great new family car or perfect for someone looking to buy their first vehicle. The Kia Rio has everything you could want—keyless entry, power windows, power folding mirrors, a leather-wrapped steering wheel, and even a rear camera display! The aerodynamic shape also allows for excellent fuel economy at 37 mpg on the highway*. 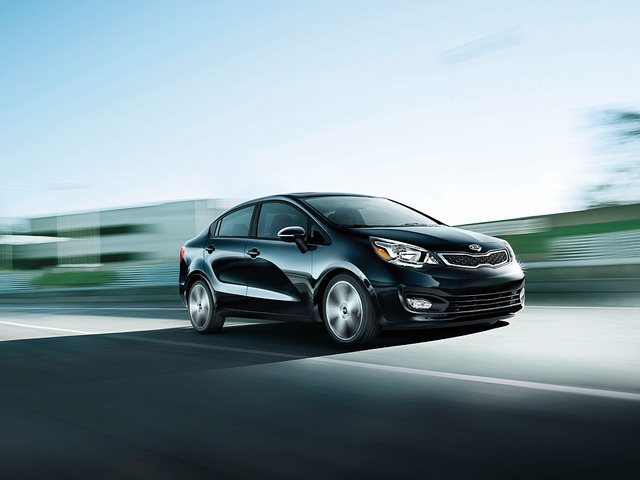 Stop into Carriage Kia to take a 2015 Kia Rio for a spin today! The 2015 Kia Rio is available in 3 trim levels: Kia Rio LX, EX, and SX. The 2015 Kia Rio operates on an efficient 1.6L DOHC 16-valve inline 4 engine generating 138 horsepower and 123 lb-ft of torque. The 2015 Rio can achieve up to 37 mpg highway and 27 mpg city*. Get efficient gas mileage in a spunky 2015 Kia Rio! The 2015 Rio has amazing standard exterior features including: Body-color exterior door handles, black mesh radiator grille, dual body-color power heated mirrors, front variable intermittent windshield wipers, heated rear glass with timer, halogen headlights, chrome bumper air intake, locking fuel-filler door, 15-inch wheels with full covers. Higher trim levels have some more great available features to choose from such as a black mesh radiator grille with chrome surround, outside mirrors with turn signal indicators, power-folding outside mirrors, auto light control, front fog lights, LED positioning lights, LED rear combination lamps, dual exhaust tips, and 17-inch alloy wheels. Discover the perfect look for your new Kia Rio on the LX, EX, or SX trim! 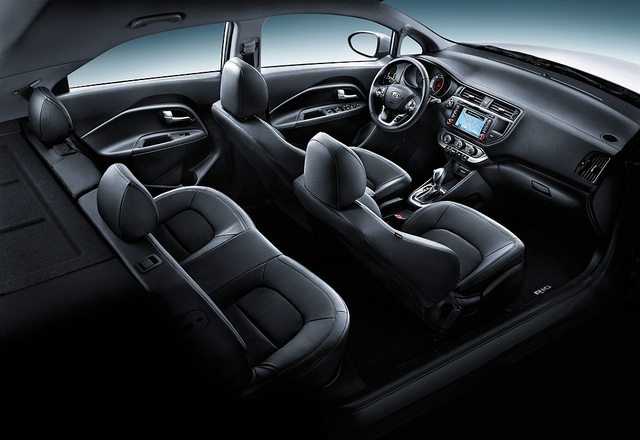 The 2015 Kia Rio has all of the interior features you could ever need! The 2015 Kia Rio comes standard with convenient interior features including: Active ECO System, air conditioning, trip computer, front and rear door map pockets with bottle holder, dual front cup holders, woven cloth seat trim, AM/FM/CD/MP3/SiriusXM Satellite audio system with 4 speakers, USB/auxiliary input jack, and steering wheel-mounted audio buttons. Find available features on the EX and SX trims such as steering wheel-mounted cruise control buttons, center console with sliding armrest and storage, premium knit cloth seat trim, 4 speakers with A-Pillar-Mounted tweeters, Bluetooth® Wireless Technology with steering wheel-mounted control buttons, rear camera display, steering wheel-mounted paddle shifters, supervision meter cluster, leather-wrapped steering wheel and gearshift knob, and the UVO Infotainment System. With a starting price as low as $13,990*, it’s easy to get everything you want in your new Kia Rio! Some of the standard safety features on the 2015 Kia Rio include: dual front advanced airbags, dual front seat-mounted side airbags, full-length side curtain airbags, 3-point seat belts for all seating positions, front seat-belt pretensioners, 4-wheel disc brakes w/ Antilock Braking System (ABS), Vehicle Stability Management (VSM), Electronic Stability Control (ESC), Electronic Brake-force Distribution (EBD), Hill start Assist Control (HAC), Tire-Pressure Monitoring System (TPMS), side-impact door beams, front and rear crumple zones, Lower Anchors and Tethers for CHildren (LATCH), and rear child-safety door locks. 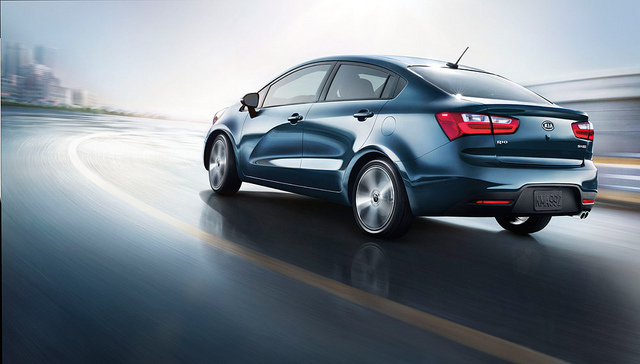 Be sure to stop into Carriage Kia and take a ride in a 2015 Kia Rio today! With our large inventory, our team here at Carriage Kia loves helping our customers find the perfect new car or used car for them! Please feel free to contact us if you have any questions or would like to schedule a test drive!